Rest in peace, 2010. Your last night has arrived. Those of us in Athens to see you off have many an option to celebrate your departure. Just beside the Academy of Arts and Sciences along Panepistimiou Ave is Omirou street. Turn in and go straight until you reach Cafe Boheme, the most international bar/cafe of Kolonaki. Famous for throwing spectacular meet-and-greets, their New Year’s Eve bash will be picking up around 11pm and has the theme “Glitter and Glam” so get your sparkle on and be ready to gorge yourself on fresh seafood, like lobster risotto and linguini with crayfish and lime. Champagne will be flowing, or buy your own bottle of Henri de Verlaine for 35 euros if you think you’ll be feeling extra festive, but take it easy so that you can last beyond the midnight hour when Lazaro Depestre will pick up his saxophone and put on a real show. Cassandra Wagstaffe, the bar’s English proprietress, has usually been in her laboratory inventing new, exotic cocktails for the occasion; you should be sure to sample whatever is featured. She’s very proud of her kitchen as well, which uses locally produced cheeses and handmade bread. I’ve explained the benefits of Areopagus Hill in this blog dozens of times (free, always open, spectacular view) if it will impress upon you how great it is, how majestic, how memorable, I’ll say it again. 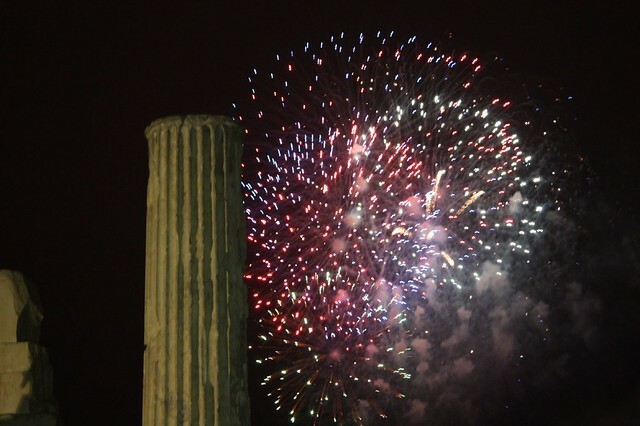 The most significant advantage Areopagus has is that you get to enjoy the firework shows put on in every neighborhood of the city by a slight turn of the head. Dress warm- it will be nippy; speaking of nips, should you bring a little somethin’-somethin’ to keep you warm on the inside, please be sure to take it with you as leave. It brings good luck for the new year, not to mention good karma. Book a table at one of the many fancy restaurants Athens has to offer. Orizontes, the highest restaurant of the city located on top of Lycavittos Hill, is famed for it’s panoramic views and that certain flair that designates a special evening. Other good options include Spondi in Pangrati, one of the most acclaimed restaurants in Athens (be prepared to pay €80 per person) or the French-Mediterranean restaurant Pil Poul in Thissio. Of the two, I recommend the second as it’s slightly less dear and hard to beat; eating in a mansion with a view of the Acropolis has its charm and a post-dinner walk along Aeropagitou would make for a plummy end to the evening. Longtime, Greek music superstar, Anna Vissi, will be performing at the Athina Arena, located at 166 Piraeus Avenue in Gazi. For a male performer, Mazonakis is playing at Votaniko Gera Odos 72, also in Gazi. Book a table and choose whether you’ll be making single drink orders or have a bottle, priced at around €150. The drinks easily add up to the same so if you’re in a group, go for the bottle. With those prices and the current economy, you would expect the place to be half-empty, but then you would be wrong. Greeks love to go and drown out their trouble with Greek music and good company. These shows should last from midnight to the crack-eyed, furry-teeth hours of the morning. Κἀλη Χρονἰα! May your 2011 be bountiful and full of adventure. Nice post. I learn something more difficult on different blogs everyday. It is going to always be stimulating to learn content from other writers and follow a bit one thing from their store. I’d favor to use some with the content on my weblog whether or not you don’t mind. Natually I’ll provide you with a link on your internet blog. Thanks for sharing. Photo (and Video) Friday: Happy National Day, Greece!